The late Tom Walkinshaw (1946-2010) has been inducted into the Supercars Hall of Fame during the Supercars Gala Awards ceremony because of his great contribution to Australian touring car racing. The Scotsman and his team Tom Walkinshaw Racing gained a success all over the world but also left a significant mark in the Australian Touring Car Championship, today known as the Supercars Championship. Starting from 1990, the TWR was the operating base for the Holden Racing Team, running Holden Commodores. 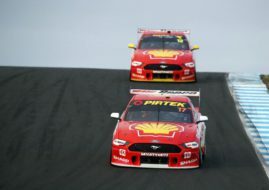 The golden age was between 1996 and 2002 when HRT won six drivers’ titles and triumphed three times at Bathurst 1000. The collapse of TWR globally at the end of 2002 halted Walkinshaw’s reign in Australia. He was back in 2005, running the Toll HSV Dealer Team to drivers’ titles in 2006 and 2007, and three more Bathurst wins in 2005, 2009 and 2011. Tom Walkinshaw died of cancer in December 2010, aged 64, leaving widow Martine and son Ryan in control of the Supercars operation. Today, the team operates as Walkinshaw Andretti United, having joined forces with Andretti Autosports and United Autosport. As a driver, Walkinshaw also made his mark in Australia. He took a pole position at 1985 Bathurst 1000 in a Jaguar XJS, finishing the race in the third place. It was his second start in the greatest Australian race. The third and the last start was in 1988 in a Group A Holden Commodore.